At the end of his lengthy presentation to DoubleLine investors in January, Jeff Gundlach, who was aggressively pitching commodities at the time, a trade that has since returned double digits, made an interesting observation: he predicted that in the next recession "we won't see a bid for safety out of stocks and into bonds." In other words as stocks tumble we "won't see a bond market rally", which means that bonds will no longer be a "safe asset." Of course, the best example of bonds acting as safe-haven assets was in August 2011, when S&P downgraded the US AA debt rating, a move which many expected would send yields surging and instead led to a 60 bps plunge in yields as stocks tumbled. Why? Because the Fed was directly purchasing bonds, not stocks. In fact, the US Treasury's most defining feature for the duration of the central-planning experiment launched in early 2009 by the Fed and its peers, is that it was the safest asset around. As Bank of America's Barnaby Martin writes echoing much of the above, "for years, the US Treasury bond has been seen as the safe haven par excellence – a high-quality asset that would rally in times of market stress and offer welcome diversification for investors’ risky portfolios. Recall that in August 2011, when S&P downgraded the rating on US sovereign debt from AAA to AA+, 10yr Treasury yields actually declined by around 60bp during the ensuing 6w." But this year, the traditional role of US Treasuries has changed because, as Martin writes, "Treasury performance has been akin to a risky asset. Our US rates team have highlighted numerous reasons for structural upward pressure on Treasury yields, including the Fed’s balance sheet shrinkage, higher US Libor rates and importantly…the jump in the US budget deficit." So what changed? Quite simply, the arrival of "America (debt) First"
As Martin further explains, for the last year and a half, the US has been at the heart of the populism narrative. But an “us first” political ideology will invariably focus on fiscal spending as a means to placate voter frustrations. The chart above, first presented last week, shows just how much the US fiscal stance has turned expansionary – and more importantly contrary to much of the rest of the world. 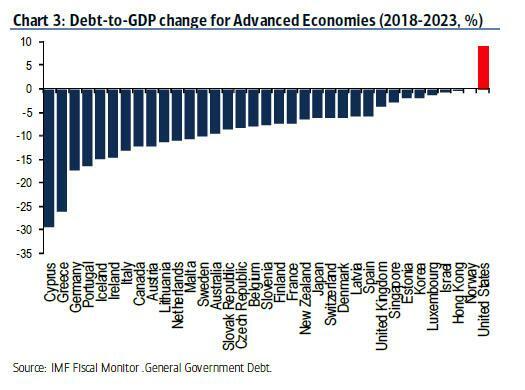 As the IMF highlight in their latest Fiscal Monitor, the US is the only Advanced Economy where debt-to-GDP is set to increase over the next 5yrs. Chart 3 shows the spectrum of debt-to-GDP changes, per country. In the US, the debt-to-GDP ratio is forecast to rise from 108% (end ’18) to 116.9% (end ’23). Contrast this to Germany, for instance, where the IMF see debt-to-GDP declining by over 17% during this period. What’s driving the expansionary debt dynamics of the US? First and foremost, the increase in spending authority by $150bn (0.7% GDP) per year, for the next two years, coupled with lower individual and corporate tax rates (tax reform) will result in US budget deficits being greater than $1tr for the next 3yrs. Meanwhile, the Congressional Budget Office recently forecast that US federal debt (held by the public) will rise close to the WWII peak over the next decade. Thus, with such an easy fiscal stance, it is perhaps no surprise then that the US debt-to- GDP ratio will cross some milestones over the next few years. 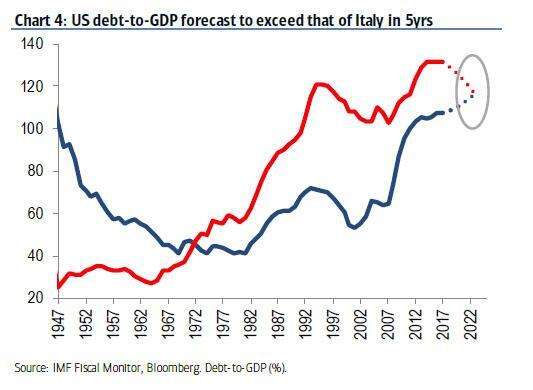 Chart 4 below highlights that US debt-to-GDP is forecast to surpass that of Italy in 5yrs. And, as Martin ominously reminds us, the supply of Treasuries that the private sector will need to digest will be much greater than during the Fed’s QE era, weighing on Treasury bond performance, and also weighing on bond prices especially if, as some speculate, China may occasionally add to the chaos by selling a portion of its own holdings when trade war push comes to shove. But if Treasurys are becoming an "unsafe" asset, what is taking their place? Here BofA global rates strategist, Ralf Preusser, makes a key observation, that the typical haven characteristic of Treasury debt is being hindered by the appealing rates of return on cash in the US. As Ralf writes, historically during periods of market turbulence, money would flow from risky assets (such as stocks) into US Treasury bonds. But with $ Libor at 2.36%, support for Treasury debt is diminishing (consider that 5yr Treasury yields are 2.84%). In other words, the rise of “cash” as an asset class is altering the traditional allocation decisions of multi-asset investors in times of market stress. This also confirms what we wrote yesterday: "It's 2-Year Yields, Not 10-Years, We Worry About Most." BofA's chart 5 highlights this point. Here's Martin: "We show the rolling 1yr correlation between total returns on 10yr Treasury bonds and the total returns on the Dow Jones stock index (daily returns). We overlay this with the evolution of 3m $LIBOR." Referencing the charts above, the BofA credit strategist notes that "a decade ago the correlation between Treasury bond returns and stock returns was significantly negative (-60%). Treasuries performed their function as a place of safe harbor, and a store of value, around the time of the Global Financial Crisis. But since then the negative correlation has dwindled and is now just -28%." Moreover, the chart shows that the changes in Treasury/stock correlation have closely followed the evolution of 3m $LIBOR, as Ralf has pointed out. In other words, higher LIBOR rates have coincided with weaker Treasury/stock correlations. State Said differently, “cash” has started to become an attractive place to park money in times of market stress, and especially so since mid ’17 – when $LIBOR began to rise more vigorously. Finally, as chart 8 above shows, the rolling 1y beta between Treasury bond returns and stock returns has also declined since the start of 2017, highlighting the reduced sensitivity of US rates to fluctuations in the stock market. The competition from “cash”, therefore, seems to be challenging the traditional safe harbor characteristics of US Treasuries. To this, all we could add is that as the Fed raises rates, it will progressively make cash the "safer haven" to US Treasury, which will result in even higher yields, and - because the Fed cofuses this with inflation - higher rates, until it hikes too far, too fast and the economy crashes into a recession, or depression. Meanwhile, all those investors who bought up trillions in "safe assets" - for repo market, collateral posting purposes or otherwise - will be forced to shift their attention elsewhere, most likely Europe where the ECB is still an undisputed "sponsor" of the long end thanks to the ECB's ongoing QE. How that will impact the European, and global bond market, will be discussed in a subsequent post.